Home /Go, Speed Racers, Go! When designing a national championship downhill mountain bike course, there is one key principle: The starting line must be higher—a lot higher—than the finish. That’s precisely why snowless ski slopes, like the ones at Beech Mountain Resort in the off-season, are ideal venues for gravity-assisted cycling events. 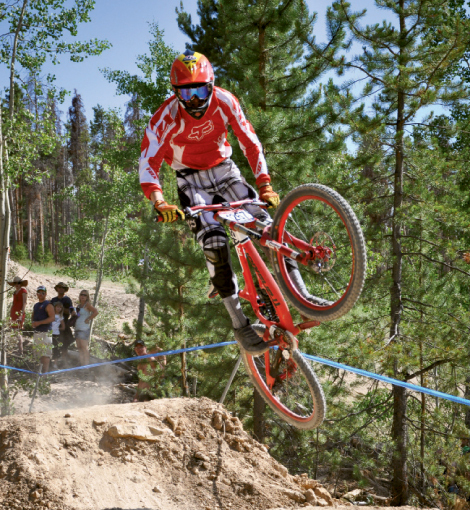 The High Country ski area will host more than 800 professional and top amateur cyclists for the 2011 Mountain Bike Gravity National Championships September 22-25, and again in 2012. “The best comparison is downhill ski racing,” says Brevard native and 2007 dual slalom national champion Christopher Herndon. “Gravity racing is the same idea on mountain bikes.” Herndon is also the premier builder of downhill courses in the Southeast and engineered the Beech trails. The event is the capstone for one of three pro mountain biking tours sanctioned by USA Cycling, and as Herndon points out, the most extreme. It will take pro riders just two and a half minutes to plunge 850 feet of elevation over rough terrain and obstacles, making airy leaps.